Each layer can be edited through the Layer Properties. Double click on the layer in the Layer List. Select a layer and Edit Layer tool from the Layer tab. Select Edit Layer function from the drop down menu. Change the name of the layer. Layer data source – path to the layer in the File Manager or Database. 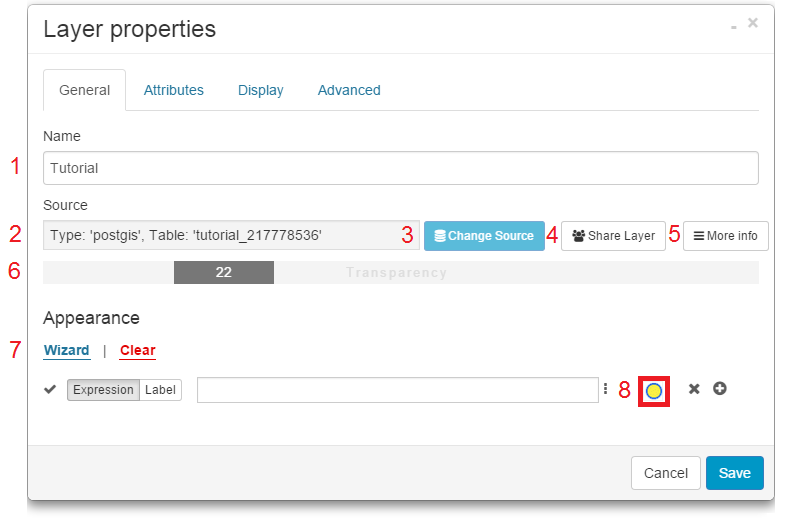 Change source – if the layer source is deleted or changed, data won’t be shown in the data grid and geometry won’t be visible. It is possible to change the layer path to some other datasource, click here for more info. 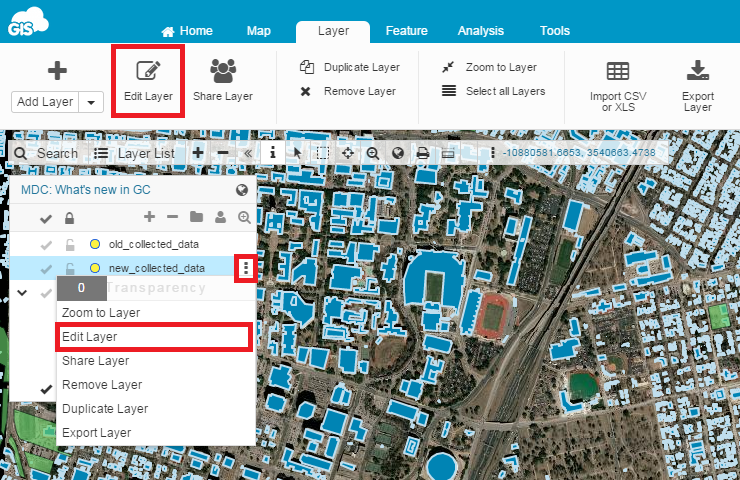 Share layer – it is possible to share a layer within a map with different permissions then the map. Click here for more info. More info – display more info about the layer (layer ID, type, object count, projection). Layer transparency – set the layer transparency by dragging a slider to the right. Click here for a quick video tutorial. Classification wizard – make a classification based on distinct or continuous values. 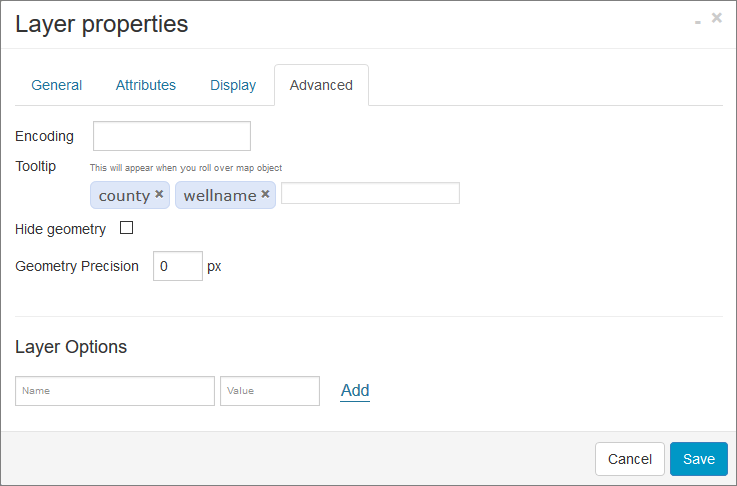 Appearance – set layer symbology, labels, visibility levels etc. Click here for more info. 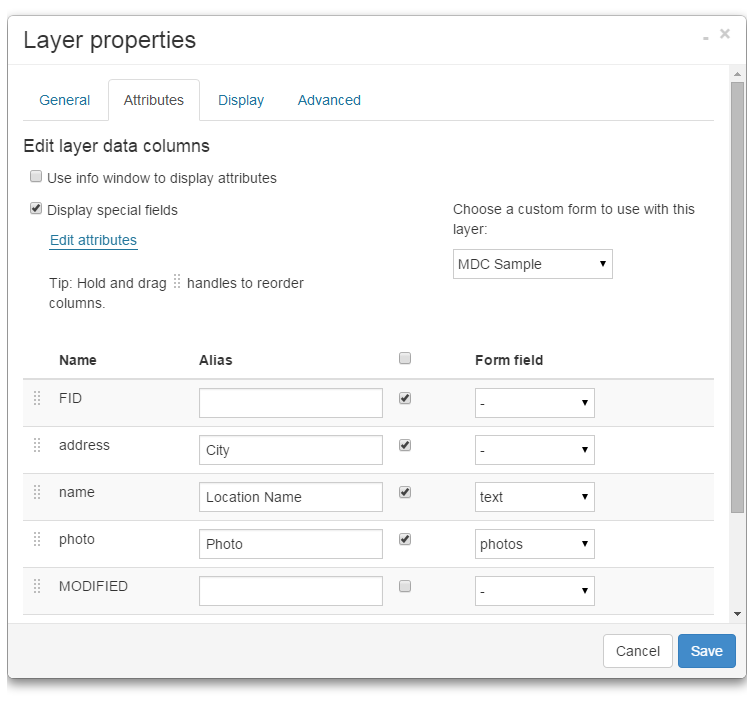 Attributes tab – Edit layer data columns, attach a form to the layer and add the column alias. Click here for more info. 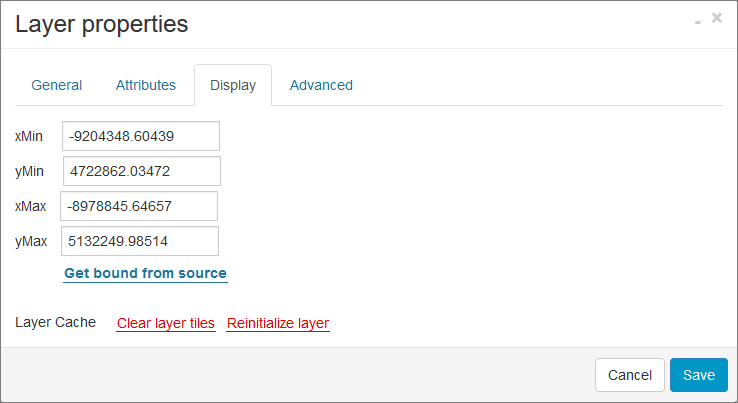 Display tab – Define layer bounds and recache a layer if there are issues with the geometry display. Layer bounds define a box within which the layers’s features are visible. If the feature reside outside the bounding box, it won’t be visible. Note that the layer bounds coordinates have to be defined in the map projection. Click here for more info. Advanced tab – Define layer encoding, tooltip (non-permanent labels that appear on the mouse hover) settings or hide geometry. Click here for more info.